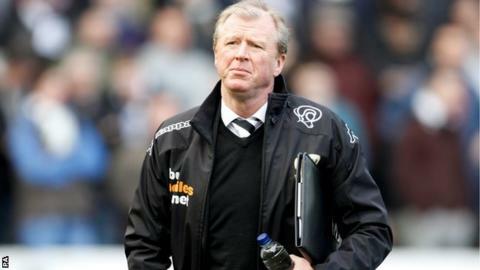 Derby County boss Steve McClaren says the Championship match at Middlesbrough will be a "strange" experience. He spent five years as Boro manager, guiding them to their only major trophy by winning the 2004 League Cup. At Boro, McClaren won the 2004 League Cup, placed seventh in the Premier League in 2005 and reached the 2006 UEFA Cup final. Those achievements helped secure the England job, and he has since managed FC Twente (twice), Wolfsburg, Nottingham Forest and now Derby. "I had five great years there and still live in the area. This will be my first time in the away dug-out - it will be strange," he told BBC Radio Derby. The 52-year-old has guided the Rams to fourth place in the Championship, with 17 wins from 29 games. He is now in his seventh managerial role, but was a rookie boss when he took over at the Riverside in 2001. Despite that inexperience, he arguably became the club's most successful manager. "I went back to Middlesbrough recently for the 10-year anniversary of the cup win which was very nostalgic," McClaren continued. "It was a great time with all the excitement around European football. But my total focus will be on our performance and trying to win." Derby were 14th in the table when the Yorkshireman took charge, but now play-off qualification looks secure with an 11-point cushion to seventh spot. The East Midlands outfit last played Premier League football in 2008, while Boro were relegated from the top-flight a year later. "Derby and Middlesbrough are similar clubs in that they're the real heartbeat of the town," McClaren added. "The football club is so important for the whole community because they take great pride in its success."